What's with all the Musou these days? What started off as a fun series about ancient Chinese warriors laying the smack down on hundreds of useless trash-mobs has blown up into a genre of its own, and it is starting to overtake the industry one series at a time! For those of you not familiar with the term, Musou is the Japanese title reserved for the Dynasty Warriors games. The sub-genre of action game puts players in control of a single soldier, and his goal is to complete objectives over an entire battlefield. Of course, when going about his business, enemy units will jump in his way, and he'll have to cut down each and every one of them with a series of simple yet flashy attacks. Basically it's one versus a thousand, and the odds aren't exactly in the favor of what the simple math entails. Dynasty Warriors of course came first, but developer Omega Force first branched out to Samurai Warriors in favor of Japanese history. When that took off in Japan, anime companies began licensing their franchises to sell even more cheap, simplistic games to their Japanese audience. One Piece, Gundam and Fist of the North Star all come to mind as being the biggest anime Musou games to date. Recently though, the genre has spread from anime into even other video game franchises. The most high profile is The Legend of Zelda, with Hyrule Warriors launching Friday. 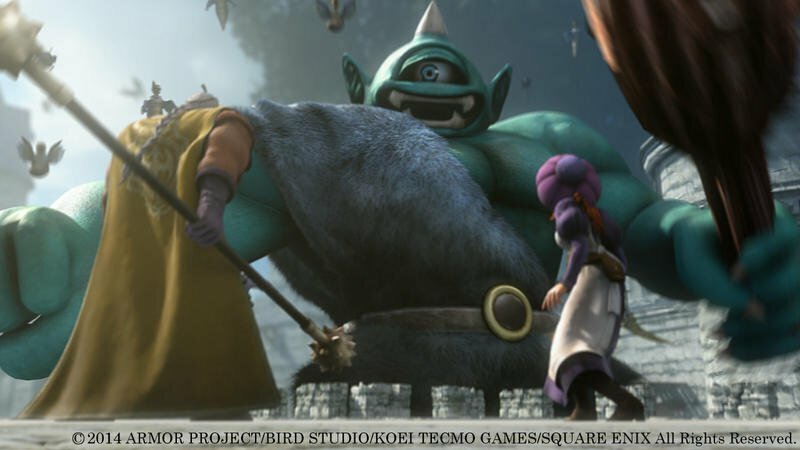 Not long after Hyrule Warriors was released in Japan, Square Enix also went ahead and announced that Dragon Quest would be getting its own Musou game as well. Two of Japan's most beloved video game series "gone Musou!" Musou games are cheap, easy to make, and they sell a lot of copies, meaning high profits. With that in mind, here are a few other franchises that we would like to see make the leap (or shall we say slide) into Musou territory. Omega Force has already blown our minds with The Legend of Zelda and Dragon Quest. Why not find another series that plays along the lines of both: Nintendo's Dragon Quest-clone, Earthbound? For one thing, the game already has a huge selection of settings perfect for setting up crazy action scenes. Be it in Earthbound's modern day cities or on its distant planets, the game has plenty of interesting locations that Ness and his friends travel to in their dangerous journey. Speaking of which, we already have found characters available as well. Ness and his boyish toys bring some much-needed melee into the mix. Yo-yos, baseball bats, and an endless barrage of magic. Not half bad. Pauline also can dish out the elemental attacks because naturally, she's a girl in a JRPG. Of course magic is her style! Following with the two main characters, Jeff is the inventor who can create a wide variety of machines and vehicles to help him plow through the hundreds of foes in his way. And there is always Poo, martial artist master who is a natural fit for the genre. Together, these four kids charge the ranks of hippies, aliens, gangsters, and monsters of the weirdest description as they rescue Mr. Saturns on the battlefield and eat Hamburger drops to replenish their health. We're still undecided if we want battles set against the cityscapes or if we want Earthbound's psychedelic backdrops to pester players once in a while. Secret characters include a giant Mr. Saturn, Ness' Dog King, all six members of the Runaway 5, Pokey, monkey trainer Talah Rama, spandex wearing Flying Man, Lucas and the cast of Mother 3, and of course, the Gargantuan Dungeon Man. All four kid's robot forms also make an appearance. I was thinking about leaving this totally video game focused, but based alone on the number of anime spin-offs the Musou series has seen, you might as well go with the best of the best anime, am I right? Maybe not all of Miyazaki's universes are prime for action game set pieces, but Omega Force could certainly cram some imagination in there to find ways to make it work. Imagine Totoro gliding across the battlefield, using his massive size and gaping mouth to crush and chew enemy soldiers from Howl's Moving Castle. Imagine the robots from Castle in the Sky coming to the aid of Nausicaa and Kiki as they battle the insects of the Toxic Jungle or the boars from Princess Mononoke. Spirited Away allows access to a huge assortment of enemy yokai, Japanese folklore monsters, for some interesting enemy designs. I would love to battle the No-Face as Chihiro, or take control of Porco as he swoops into take pot shots at an angry horde of shape shifting Pom Poko raccoons. Don't even get me started on Ashitaka, who is the perfect build for any RPG character I roll. Other great character choices come from the wolf princess San, the indestructible Pazu from Castle in the Sky, the evil half fish/half human form of Ponyo, the scarecrow, elder Sophie, Califer, and Howl all from Howl's Moving Castle, and of course, Lupin III and his crew, Jigen, Goemon, and the foxy Fujiko from Castle of Cagliostro. Granted, it is hard to cram a few films in there. Not much is coming to me in thinking about how to desecrate Grave of the Fireflies in such ways, but if there were a way, Omega Force would find it. They can Musou anything! If there's one genre that needs its own Warriors title, it's survival horror. "But wouldn't that be wildly inappropriate?" you ask. In some ways, yes. In other ways, the fit is perfect. Games like Silent Hill, Dead Space, Resident Evil, Fatal Frame, and Deadly Premonition are known for their atmosphere. Combat typically occurs in tense, intimate situations. Ammo is limited and melee weapons are improvised or are simply the fighters' fists. Many of these games feature characters ill suited to combat – everyday people and engineers. Sometimes you get someone trained, presumably by the U.S. government, to fight. Musou games, on the other hand, are known for wild combat in huge fields performed by significant actors in history wielding great, impressive weapons. The mismatch could make for an entertaining take on these sorts of games, or it could just be as inappropriate as we think. With that said, survival horror games, especially the Japanese takes on the genre, have the real crucial seed to join the Musou genre: Unbearably bad and totally hilarious voice acting. No other genre of games is as known for bad voice acting as the Musou and Survival Horror games. For every "I am Cao Pi" in a Musou game, there's a "Why don't you, Master of Unlocking take this lock pick" in a Survival Horror game. Plus, the unlockable bonus level would let you play as Silent Hill 2's Pyramid Head and take on a shivering horde of legs with legs. Stay with me on this. Choosing from some of the most memorably violent players in modern football, you take on the entire World Cup lineup. Players like Luis "The Cannibal" Suarez and Zinedine Zidane, armed with only a ball and their trademark violence, step into stadiums and go to work. The twist is that this is football, and no one dies. They just act like they're dying. The ref is watching the whole time, and you have to take down your opponents without the referee spotting you. Use special techniques to disguise your moves or just keep enough players in between to keep yourself safe from suspicion. Meanwhile, watch as throngs of your opponents lie on the ground, as good as dead, clutching their knees even though you hit their shoulder. Let's just hope no one is faking it, lest an opponent return for a second helping of pain. Jokes are over. Sure, I'm a Zelda and Dragon Quest fan as much as the next RPG nerd, but the level of fandom I feel towards those don't reach the same levels of derangement as it does for Suikoden. -A massive world with borders constantly redefined by acts of war. Recreating the biggest moments of each game would be no problem for the adept Omega Force. -Over 500 unique characters to choose from as there are 108 in each game. That isn't even beginning to count the villains either. Even sticking to Suikoden II's massive cast would be a chore in itself. -From those 500 characters, large portions of them bring a unique weapon into battle. Suikoden is loaded with the kinds of fighting styles that Omega Force likes to exploit. Swordplay, martial arts, guns, magic, you name it. Some characters even fight with household objects. It's a fanboy's dream, but what the heck? If Konami isn't going to use the Suikoden franchise anymore, then maybe Omega Force could create a Musou game and convince the Japanese audience that it still has merit.